My facility and I are fully licensed in the state of Florida. 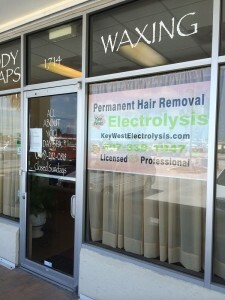 I am a CPE, Certified Professional Electrologist. This is the highest credential in the electrolysis profession. In order to keep absolutely current in my field, I attend the American Electrology Association annual national convention every year. I take continuing education courses every year, well beyond the required 20 hours of continuing education credits we are required to take each two years. At Key West Electrolysis, we use the newest, highest rated machine in the world, the Apilus Platinum Pure 27 MHz. It increases the effectiveness of electrolysis permanency, gives jaw-dropping results and decreases any reaction you may have to treatment. Not only do we use the finest electrolysis machine on the market, I also routinely visit Dectro, the manufacturer, for education on electrolysis advancements resulting from their research. To increase your level of comfort, your treatment may be performed as you lie on a Biomat 7000. This maximizes your comfort through the use of heated amethyst crystals, which activate deep body-penetrating healing properties. Your after-treatment care includes calming electrophoresis and the application of emu oil to speed cell repair. I am relentless in my focus, I utilize the world’s premier electrolysis instruments. I partner with you in fulfilling your hair removal goals on any area of your body.